How important is communication to the success of your business? I feel confident anyone running a business, especially a chiropractic business, recognizes just how key quality communication is really is. In fact, there isn’t a single aspect of your business that doesn’t require it. Marketing, copywriting, case reviews, reports, feedback cycles, and especially public speaking! In every instance you are strategically moving your prospects down a funnel with the end goal of making a “sale”. I know that word may be taboo in chiropractic and other health care professions but that’s exactly what you’re doing. You’re selling someone on a future result that benefits them…s o you had better be incredible at doing it! On today’s episode we speak with communication expert Roberto Monaco. Not only has Roberto being coaching thousands of clients to success for years, but he has an affinity for working with chiropractors as chiropractic has made a massive impact on his life. Enjoy today’s episode…I’m absolutely certain what you hear will be on your to-do list right way. Why Roberto has special affinity for chiropractic and how it has increased his excitement to ensure you become an expert communicator. The 5 categories you must include in all of your talks if you expect to bring the audience with you all the way to the end (and beyond). The biggest challenge that faces chiropractors from the stage and how to start overcoming it. What is LODI and how will it affect your results. How much time you should spend practicing your close if you expect it to actually work. 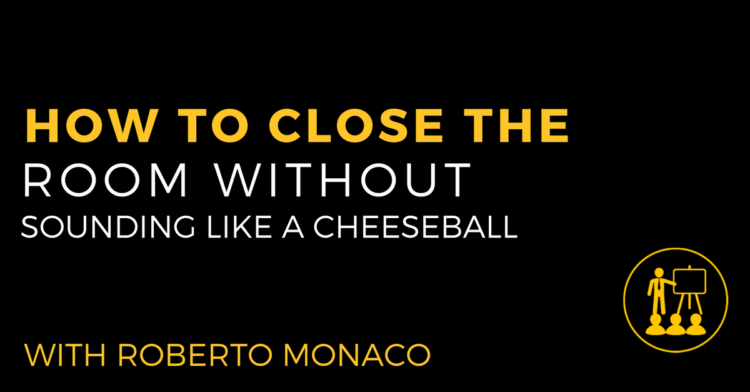 The 3 F’s of creating the perfect close and detailed examples of Roberto doing them for you! < Previous Post #38 Is Selling Ketones In Your Practice A Good Idea?